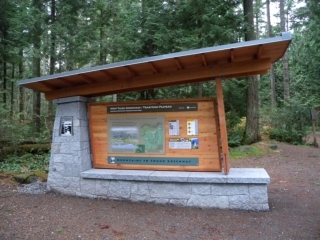 The Mountains to Sound Greenway now has eight interpretive kiosks along Interstate 90 between Seattle and Cle Elum. They were designed by Jones & Jones Architects and Landscape Architects. The kiosks are at recreation and visitor sites throughout the greenway. The kiosk at the High Point Trailhead on Tiger Mountain is shown here. Others are at the Mercer Island Lid Park, Snoqualmie Point Park, Rattlesnake Mountain Trailhead, Rattlesnake Ledge Trailhead, Mount Si Trailhead, Iron Horse State Park Trailhead at Hyak at Snoqualmie Pass, and the Wye Park in downtown Cle Elum. Each kiosk lets visitors learn about the area, and visitors with newer smart phones can use them to learn more about local history, area trails and wildlife. They will also be able to take pictures of maps and view the greenway's website. The interpretive panels are by Denise Dahn. The area along Interstate 90 within the greenway is a National Scenic Byway so the kiosks received grants from the National Scenic Byways Program. Additional support came from Greenway Trust founding president Jim Ellis, Jones & Jones and The Trust for Public Land.